This week we are celebrating Milkweed Editions’ publication of Fiction on a Stick, an anthology of stories by Minnesota writers, by featuring some of the contributors. Today we’ve got John Reimringer, who has worked as a newspaper editor and college instructor. 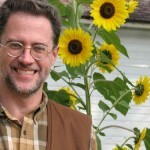 Reimringer is the recipient of two Minnesota State Arts Board grants, he has published stories in Carolina Quarterly, Colorado Review, Louisiana Literature, and Gulf Stream Magazine. He and his wife, the poet Katrina Vandenberg, live in St. Paul, where his great-grandfather was married in Assumption Church in 1880 and died in a drunken fall from a sleigh at the second-ever Winter Carnival in 1887. Mr. Reimringer loves St. Paul, but hasn’t gone to the Winter Carnival. The Night Birds by Thomas Maltman. It’s about the Dakota Sioux uprising in Minnesota in 1862 and its fallout, and Tom is my colleague at Normandale and a beautiful beautiful writer. The late Andre Dubus. If he came all that way, I’d take him to Billy’s Victorian for a Grain Belt. Taash and the Jesters. About an orphan boy and witches. And jesters. Hemingway’s In Our Time. His first book of short stories. The absolutely essential work by that great writer.